Big Job from St Austell Brewery has been crowned the Champion Bottled Beer of Britain in CAMRA’s prestigious annual award which recognises the best bottle-conditioned real ale in the country. Big Job is a big beer. At 7.2% ABV it is powerfully hoppy with both citra and centennial hops, and is jammed full of Cornish barley. With a smooth, citrus fruit taste and a hoppy, lemon smell, it is anything but subtle. Runners up include Fullers’ Vintage Ale which took home silver, and Oakham’s Green Devil IPA which won Bronze. The judging and announcement took place at the BBC Good Food Show at the Birmingham NEC, following a series of local member voting rounds and regional judging competitions throughout the year. Visitors to the BBC Good Food Show will now have the opportunity to sample the winning beer along with other finalists at a number of tutored beer tasting events run by famous beer writers as part of the Great British Beer Experience. 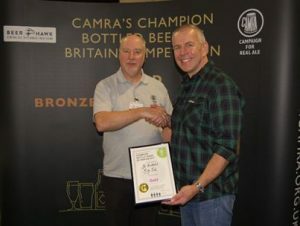 CAMRA's National Director responsible for the competition Nick Boley says: “Congratulations to St Austell for winning the Champion Bottled Beer of Britain award, one of the highest accolades in the beer world." Christine Cryne, master beer trainer and judge adds: “The standard of competition was fantastically high. Big Job is a moreish, golden beer with honey caramelised citrus notes, refreshingly smooth with a warming finish with increasing spicy dry bitter notes and a soft fruity nose. A case of the Champion Bottled Beers of Britain and finalists will be available exclusively through Beer Hawk just in time for Christmas at https://www.beerhawk.co.uk/cbbob2017.